This is security feature as not all the user can able to run the command and get your Cloud details. Also you have to authenticate yourself for running a command. To resolve this we need to download the Openstack RC file. 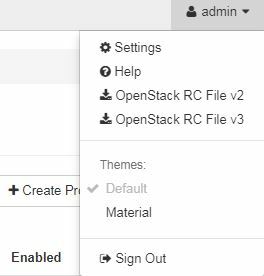 once you are logged into the openstack on top right corner of page you will see the user name once you click you will see list of options. two of them are to download the RC file version2 and version 3. Click on any of the Icon and download the file. Once its done you will be able to run the command without password.